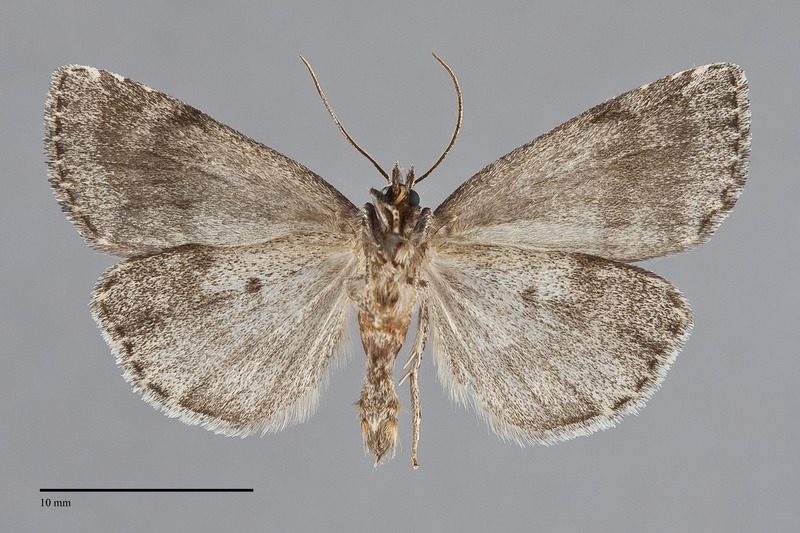 Xestia lupa is a medium-sized relatively light-bodied (FW length 15 - 18 mm; smaller in females) grizzled gray and white noctuid with light-filled lines and spots that occurs in northern British Columbia in our region. The forewing ground color is salt-and-pepper medium gray due to a mixture of dark and light scales. The irregular lines are dark gray, double, with light whitish gray filling. The postmedial line is moderately strongly scalloped. The pale subterminal line is usually evident. It is preceded by smudged dark gray spots that are usually fused across adjacent veins at the costa, opposite the cell, and in the fold. The terminal line is a series of dark spots between the veins. The orbicular and reniform spots are similar, dark gray filled with light whitish gray and usually some central gray scales. The orbicular spot is round to oval, while the reniform spot is shaped like a sideways heart. These spots are usually connected by a black line across the posterior cell. The claviform spot is small or incomplete. The hindwing is pale whitish gray with faint dark discal spot, postmedial line, submarginal band, and terminal line between the veins. The fringe is pale gray. The head and thorax is hoary dark gray with a slightly lighter tip to the collar. The male antenna is filiform. This species is similar to Xestia speciosa and Xestia mixta in general appearance but is smaller and much less robust. The reniform spot is less suffused with gray than in these species and the black marks before the subterminal line are more likely to be fused into a band or series of ill-defined patches than in these species. The pale reniform spot can resemble the pale crescent-shaped spot of Xestia perquiritata but is usually less constricted and is more likely to contain some central gray scales. The lines are also less irregular than in this species, especially the postmedial line which is deeply scalloped in X. perquiritata. Xestia is a large and diverse genus found throughout temperate, alpine, and arctic portions of the Northern Hemisphere. The genus is subdivided into three subgenera, Xestia, Megasema, and Pachnobia, by Lafontaine (1998). The genus is defined by a thumb-like ventral extension called the pollex which arises from the base of the clasper of the male valve. Over half of the North American species are found in the Northwest. Xestia lupa belongs to the subgenus Pachnobia. This species occurs in boreal and montane spruce-fir forests. It is most common in wet forest, including bogs. 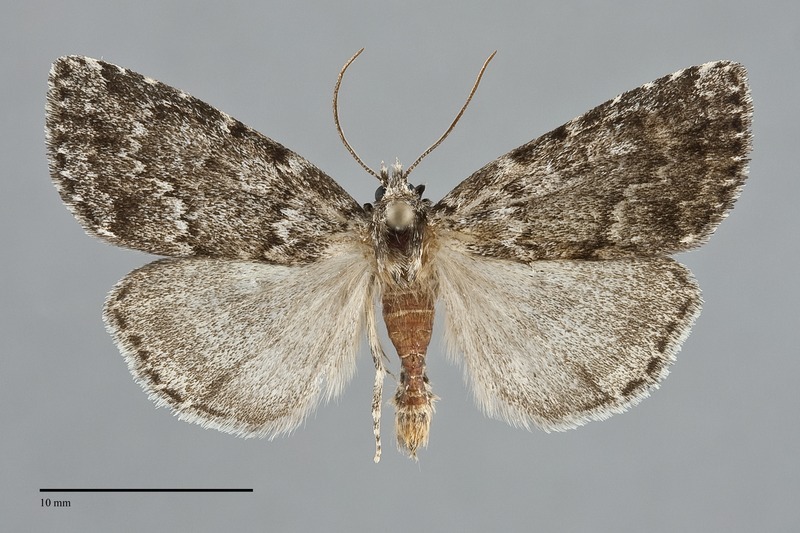 Xestia lupa has only been found in extreme northwestern British Columbia near Atlin. It likely occurs elsewhere in the northern and north-eastern portion of the province. This species occurs across subarctic North America from Alaska to Labrador as far south as north-central Manitoba. It is also known from the Rocky Mountains in Alberta. This species is nocturnal and flies in July. It is attracted to lights in areas where it is sufficiently dark to blacklight, but it is a slow flier and can by netted by hand. Females have much smaller wings than the males and are presumed to be flightless (Lafontaine 1998).